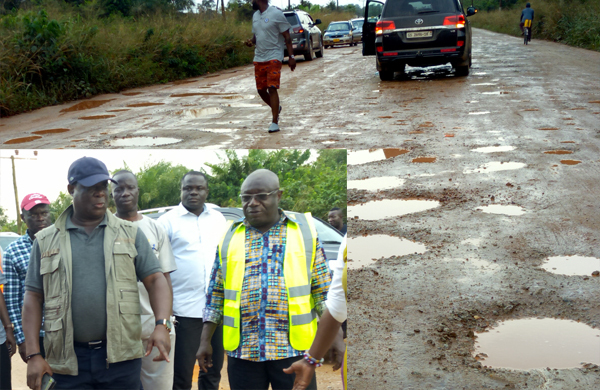 The Minister of Roads and Highways, Kwasi Amoako-Attah, who was in the Western Region for a two-day working visit was visibly angry when he got to Nkroful and saw the deplorable road from Esiama to Nkroful, the birthplace of Ghana’s first president, Dr. Kwame Nkrumah. The minister could not fathom why the road that leads to the hometown of Ghana’s first president should be in that poor state for years. The Esiama-Nkroful road in the Ellembelle District has been in a terrible shape for many years despite promises by previous governments to fix it. The people in the area have been pleading for some elevation of the stretch, considering the fact that the area attracts tourists. According to the minister, he gathered that the 8-kilometre road was awarded on contract in 2015 but the road was not done because the contractor was not paid. He, therefore, asked his directors to re-award the contract to another contractor immediately so that construction works on the road could begin. It would be recalled that during the 2012 electioneering campaign, the then candidate Nana Akufo-Addo was not allowed to use the road when he took his campaign to Ellembelle. The NDC activists in the area informed the then NPP candidate that the road was being constructed and that a bridge on the road was also being repaired so Nana Addo should not use the road. Addressing a durbar of chiefs and people later at Nkroful, Mr. Amoako Attah stated emphatically that government would give a facelift to Nkroful, the capital of the district and hometown of Ghana’s first president, Kwame Nkrumah. He was disappointed at the bad nature of roads in the area and gave an assurance that the current government of the New Patriotic Party (NPP) led by Nana Akufo-Addo would put measures in place to fix the roads. “I agree that the road from Esiama to Nkroful is in a deplorable state, but let me assure you that steps would taken to repair it”, he stressed. The Ellembelle District Chief Executive (DCE), Kwasi Bonzoh, noted that he was told the terrible eight-kilometre road from Esiama to Nkroful had been awarded on contract for partial construction, before becoming a DCE. He asserted that after being in office for close to two years, nothing showed that the road would be fixed and that his investigations revealed that funding was the problem. He continued “under the current NPP government, the road will be awarded on contract and very soon a contractor will start work on the road. It will be an asphalt road”. The chiefs in the area stressed that the Ellembelle District was proud to have so many oil companies but expressed worry about the deplorable state of the Nkroful road. They, therefore, appealed to the government to construct the road as a sign of recognition for Dr. Kwame Nkrumah.